Last year, I gave a presentation about blogging. Integrating blogging into a lesson covers many standards at all grade levels. No matter what the topic is of a blog post, it will cover quite a few standards related to writing. The more the teacher is involved in the blog, the more standards that will be covered. If a teacher provides frequent feedback on the blog, permitting students to rewrite posts, most of the writing process steps are covered (brainstorming, outlining, rough draft, revision and editing. Since blogging is a published product, the last step of the writing process is included in a way like no other, as the post, if it is made public, has the potential to be viewed by thousands of people. 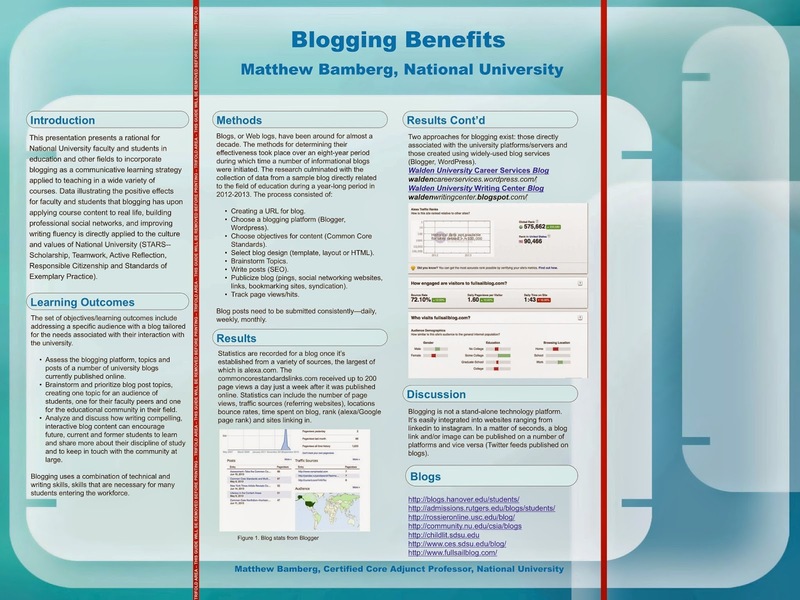 This presentation presents a rational for National University faculty and students in education and other fields to incorporate blogging as a communicative learning strategy applied to teaching in a wide variety of courses. Data illustrating the positive effects for faculty and students that blogging has upon applying course content to real life, building professional social networks, and improving writing fluency is directly applied to the culture and values of National University (STARS--Scholarship, Teamwork, Active Reflection, Responsible Citizenship and Standards of Exemplary Practice). The set of objectives/learning outcomes include addressing a specific audience with a blog tailored for the needs associated with their interaction with the university. Assess the blogging platform, topics and posts of a number of university blogs currently published online. Brainstorm and prioritize blog post topics, creating one topic for an audience of students, one for their faculty peers and one for the educational community in their field. Analyze and discuss how writing compelling, interactive blog content can encourage future, current and former students to learn and share more about their discipline of study and to keep in touch with the community at large. Blogging uses a combination of technical and writing skills, skills that are necessary for many students entering the workforce. Blogs, or Web logs, have been around for almost a decade. The methods for determining their effectiveness took place over an eight-year period during which time a number of informational blogs were initiated. The research culminated with the collection of data from a sample blog directly related to the field of education during a year-long period in 2012-2013. The process consisted of: Creating a URL for blog. Choose a blogging platform (Blogger, Wordpress). Choose objectives for content (Common Core Standards). Select blog design (template, layout or HTML). Brainstorm Topics. Write posts (SEO). Publicize blog (pings, social networking websites, links, bookmarking sites, syndication). Track page views/hits. Blog posts need to be submitted consistently—daily, weekly, monthly. Statistics are recorded for a blog once it’s established from a variety of sources, the largest of which is alexa.com. The commoncorestandardslinks.com received up to 200 page views a day just a week after it was published online. Statistics can include the number of page views, traffic sources (referring websites), locations bounce rates, time spent on blog, rank (alexa/Google page rank) and sites linking in. Two approaches for blogging exist: those directly associated with the university platforms/servers and those created using widely-used blog services (Blogger, WordPress). Blogging is not a stand-alone technology platform. It’s easily integrated into websites ranging from linkedin to instagram. In a matter of seconds, a blog link and/or image can be published on a number of platforms and vice versa (Twitter feeds published on blogs). Evidently this movement is alive and well in the U.S. Among its many assets are charter schools. Finally, you might want to know that a charter school near you (http://charterschoolscandals.blogspot.com/…/lab…/*California) is a Gulen school--a strict, academic math/science curriculum. Is there a twist? Many teachers are concerned about finding lesson plans that meet the Common Core standards, not to mention materials and resources that they can use to teach them. The Library of Congress Teachers website offers both. The website contains an simple drop-down search menu that allows teachers to pull up lesson plans with corresponding resources in the Library of Congress' collection. Explore this copious online platform for instant lessons and materials that meet specific Common Core objectives. The search enables teachers to search for a lesson by grade level that links to both student and teacher resources for the lesson. The teacher's resources include activities and step-by-step lesson plan tabs. The student resources contains links to readings and tasks that contain image galleries and multimedia. A good example of a lesson for fourth grade is "The Civil War though a Child's Eyes," an enormous learning experience for students to see the Civil War as if they were a child in that era. Students will determine the theme or main idea of the text by summarizing gist of article as demonstrated by participation in a close reading activity. 2. Teacher refers to learning target above. 3. Teacher instructs students to read article to get familiar with it. 4. Teacher allows five minutes for students to red the article. Teacher observes students by circulating around the room. 5. Teacher explains the pair/share grouping with their A/B partners to discuss the main idea of the article with four details. Check for understanding by questioning. 6. Teacher initiates discussion to get students motivated to talk about reading selection. Students follow, speaking when called upon using fairness cards. 7. Teacher announces that student will read the selection one more time, but in a different way, so they can remember the important points of the reading. Teacher instructs and models to students how to annotate by thinking aloud when writing on the selection under the Elmo, demonstrating a few annotations (one key detail, one confusing word and one question) he would make. 8. Students read the selection once more but this time with a pencil, annotating (making notes) on their article by writing on it. These annotations are required to include one key detail, one confusing word and one question about the reading selection. The teacher will repeat the directions and ask questions to check for understanding, then students will read for 6 min. 9. After allotted time, teacher instructs students to pair-share with their table partners what they wrote down. 10. Teacher instructs in learning strategies context/dictionary/oral for defining unknown words. 11. Teacher uses fairness cards to ask students to share their key details, confusing words or phrases and unanswered questions with the class. Teacher writes down a few examples of each while students share their findings. 13. Teacher instructs students to do a third reading in which students search for the author's purpose and determine text structure. 14. Teacher allots five minutes for students for students to "dig deeper" by finding the reading selection's purpose and organization. Teacher circulates around room for informal observation. 15. Teacher instructs students to pair-share with left/right partner or table what the author's purpose and text structure is for the article. 16. Teacher uses fairness cards to ask students to share what their partner/group has discussed and writes down each students response to come up with a general statement about purpose and organization. 17. Teacher reviews how to make text-to-self and text-to-world connections by thinking aloud to model each connection from article. 18. Students are directed to read article one more time to make text to self and text to world connections. 19. Teacher instructs students to pair-share with their right/left partners their connections. 20. Teacher uses fairness sticks to have students share their connections with class. Teacher writes connections on white board. Teacher asks class to hold up fingers to rate their opinions of the article, using a rubric scale of 1-4, with four being very good. Repeat lesson with new article, allowing for more guided and independent practice. Mini lessons on context clues, text structure, main idea and details. Below is some information about the current state standards adoptions for all subjects with regard to CCSS. CCSS has not been developed for history/social science in California as of this date. Beginning teachers often confuse Literacy ELA literacy standards for history with California State Content Standards for history/social science. CCSS for content history/social science have not yet been adopted so teachers and administrators have to refer back to the old California Content Standards for history/social science because those are currently being used. Science CCSS has been developed; however, it's also referred to as NGSS (Next Generation Science Standards). The link is below. Again--Common Core History/Social Science content standards have not yet been adopted. There are, however, ELA Common Core Standards for History, standards that are not content related. Finally, one other element, Common Core, is worth mentioning, which emphasizes that instruction based on authentic, real-life topics. CCSS developed the Standards drawing upon input from educators and educator groups, higher education stakeholders, content experts, parents and the public" (Thatcher, 2012). For this reason, the state officials who initiated the standards had relevant real-life input about what their worker's skill-sets are and how students can successfully complete tasks related to them. Students will (concept and skill) by (cognitive application from Hess DOK) as demonstrated by (type of cooperative group activity). Student Learning Targets Changed to Teacher Learning Targets using DOK (depth of knowledge) and collaborative learning. RL 5 I can refer to structural elements to explain major differences among poems, and prose. Students will be able to refer to structural elements to explain major differences among poems, and prose by comparing a selection of one with the other demonstrated by jigsaw. RL 7 I can make connections between the written text of a story and a visual or oral. Students will be able to make connections between the written text of a story and a visual or oral by naming elements of narration/description in the image and matching them with text in the story as demonstrated by pair share. RI 5 I can describe the structure used in a piece of informational text. Students will be able to describe the structure used in a piece of informational text by identifying the organizational pattern (description, problem solution, chronological, compare/contrast and cause/effect) and recording the content of the structure on the appropriate graphic organizer. RI 7 I can interpret information that is presented orally. Students will be able to interpret information that is presented orally by explaining phenomena in terms of concepts from an science text in their own words as demonstrated by three-step interview . questions for the class to address. Step two, the students, in pairs become the interviewer and the interviewee. Step three, after the first interview has been completed, the students’ roles are switched. After each student has had a turn, the pairs read their interviews to the class. a. establish a situation, introduce a narrator, and organize an appropriate sequence. c. use transitional words and phrases to manage sequence of events. e. provide some sense of closure. Students will be able to write a fictional or nonfictional narrative by formulating story elements on a step-by-step brainstorming worksheet the content of the presentation in their own words as demonstrated by peer editing. W 6 I can use digital tools to produce and publish my work. Students will be able to use digital tools to produce/publish work by organizing edited content including title, author, narrative content and printing it out as demonstrated by cooperative groups. SL 2 I can paraphrase portions of a text read aloud or presented visually. Students will be able to paraphrase portions of a text read aloud or presented visually by using vocabulary words as context cues as demonstrated pair share. SL 3 I can identify the reasons and evidence a speaker gives to support points. Students will be able to identify the reasons and evidence a speaker gives to support points by constructing a graphic organizer that match each point with a reason and/or evidence. SL 4 I can speak clearly and audibly while reporting on a topic or telling a story or experience in an organized manner. Students will be able to speak clearly and audibly while reporting on a topic or telling a story or experience in an organized manner by drawing conclusions of reading selections demonstrated by jigsaw group reporting. SL 5 I can add audio recordings or visual displays to enhance a presentation. Students will be able to add audio recordings or visual displays to enhance a presentation by critiquing books/stories/informational text read as demonstrated by class presentation. L 1b I can form and use progressive verb tenses. Students will be able to form and use progressive verb tenses by combining each of the progressive tenses with a subject before the verb and a prepositional phrase after it for given verbs as demonstrated by pair sharing sentence strips. L 1d I can use adjectives in conventional order; small, red bag NOT red, small bag. Students will be able to use adjectives in conventional order small, red bag NOT red, small bag by identifying the patterns in conventional adjective noun sentences and state of being sentences as demonstrated by coop groups. L 1f I can produce complete sentences. I can correct inappropriate fragments and run ons. Students will be able to produce complete sentences by comparing independent clauses with dependent ones as demonstrated by roundrobin with group leader calling on a group member to change a fragment and/or run-on on a list into a complete sentence. L 1g I can correctly use homonyms. Students will be able to correctly use homonyms by constructing sentences for ten sets of homonyms and having a partner read them aloud and vice versa as demonstrated by pair sharing. L 2a I can use correct capitalization. Students will be able to use correct capitalization by creating a travel brochure to a California destination using correct capitalization demonstrated by jigsaw, with each group working on the same destination. L 2b I can use quotations and commas to mark direct speech and quotations from a text. Students will be able to use quotations and commas to mark direct speech and quotations from a text by modifying text that includes dialogue as demonstrated by peer editing. L 2c I can use a comma before a coordinating conjunction in a compound sentence. Students will be able to use a comma before a coordinating conjunction in a compound sentence by categorizing a mixed list of sentences that contain two independent clauses and one dependent clause with an independent clause and sentences that are not compound sentences (simple/compound subject+verb clause) as demonstrated by peer editing. L 2d I can spell fourth grade words appropriately and consult references as needed. Students will be spell fourth grade words appropriately and consult references as needed by using a choice of online dictionaries as demonstrated by peer checking. L 3a I can choose words and phrases to precisely convey ideas. Students will be able to choose words and phrases to precisely convey ideas by modifying descriptive text each as demonstrated by jigsaw, each group working on a part of a reading selection composed of vague phrases and words. L 3b I can choose punctuation for effects. Students will be able to choose punctuation for effects by comparing connotations with sentences that don't use punctuation for effects as demonstrated by pair sharing using the same text (a poem). L 3c I can differentiate between contexts that call for formal English and informal discourse. Students will be able differentiate between contexts that call for formal English and informal discourse analyzing dialogue written in dialect by combining each of the progressive tenses with a subject before the verb and a prepositional phrase after it for given verbs as demonstrated by pair sharing sentence strips. L 4a I can use context clues to figure out word meaning. Students will be able to use context clues to figure out word meaning by hypothesizing a meaning of an unfamiliar word using words/phrases around it by pair share of predetermined unknown words identified in first step of close reading. L 4b I can determine the meaning of a word by using the affix or root. Students will be able to determine the meaning of a word by using the affix or root differentiating these affixes in a word (separating them from the root word) as demonstrated by jigsaw (each group getting a list of words to analyze). L 4c I can determine the meaning or pronunciation of a word by consulting reference materials. Students will be able to determine the meaning or pronunciation of a word by consulting reference materials by reciting the word after hearing it being pronounced (using an online dictionary) as demonstrated by pair sharing. L 5a I can explain the meaning of simple similes and metaphors. Students will be able explain the meaning of simple similes and metaphors modifying banal adjectives in a descriptive/narrative writing assignment as demonstrated by peer editing. L 5b I can recognize and explain the meaning of common idioms, adages, and proverbs. Students will be able to recognize and explain the meaning of common idioms, adages, and proverbs by identifying them in literature to define them using visuals/realia/TPR as demonstrated by coop groups. Common Core has brought us a change in education nomenclature so that it can often be confusing to parents, teachers and administrators if they aren't familiar with it. Consider for a moment the translation of education terms you know into those of the Common Core in terms of student and teacher. What you used to refer to as performance objectives are now called learning targets, more specifically, teacher learning targets. New to common core is an extension of the old concept of performance standards so that they address students directly. In order to do so involves a simple task that allows you to convert each standard from a teacher's point of view to a student's. By converting the third person point of view of the standard to the first person point of view for students allows you to directly address them when they are posted in the classroom. Third Person directed to teachers/parents/administrators for RL4/RI4.1: Refer to details and examples in a text when explaining what the text says explicitly and when drawing inferences from the text. Third Person directed to students for RL4/RI4.1: I can use details and examples to draw inference from a text. So, there you have it, a conversion of a teacher directed standard to a student-friendly objective directed to students in first person. Now you can move on to develop students' DOK (Depth of Knowledge) and method of output, the means to which students produce output/product. You can get paid for your lesson plans, workbooks, thematic units and graphic organizers/thinking maps at Teachers Pay Teachers. Registration is quick and easy, taking only about 10 minutes to complete, which includes uploading a "selfie" and giving some details about your education and experience. Teaching materials are inexpensive and you can pay via paypal. Submit your teaching materials and get paid for all that work on your lesson plans. In this template, you can create one-period lesson plan in literacy and/or English/Language Arts for any informational reading selection. Simply choose a reading selection from the materials section of the lesson plan template below and apply it to each lesson plan template step. Grade 6-8 same URL for each with grade level replaced in last character. There are a wide variety of reading materials you can use for this template from websites to ebooks to textbooks. The following is a list of Internet informational reading selections for grades 2-5. Introduction: Introduce title and author (if available) of passage. Discuss what you know about the topic, including identifying it as narration, description, argument, poetry, play, subject area and so on. Relate topic to prior reading and set purpose for reading new selection. 1. Teacher reads selection aloud while students follow along (engagement). A list of websites with reading selections is included at the end of this lesson plan. If selection is from textbook, go over visuals, headings subheadings, words in bold print/italics and so on). Let students know that this is called the selective attention learning strategy. For ELLs, type names of each word into Google Images, showing students the best representation of the word. 5.Students read selection again silently. 6. Ask critical thinking questions from Bloom's taxonomy at http://www.meade.k12.sd.us/PASS/Pass%20Adobe%20Files/March%202007/BloomsTaxonomyQuestionStems.pdf Refer back to text when appropriate. After teaching a few reading selections, create tests on the following skills for the grade level/reading level you teach. The ING verb is mighty powerful. From the words creating to debating, these suffix-dependent words spell another word--MARKETING. Rarely does a suffix make its face known in the marketing community so often as the ING verb. As I develop the idea for my newest book, I take note at how effective ING verbs are as the first word in each listing of a table of contents in how-to books. Look for yourself. Every how-to book publisher uses these suffixes in their books' table of contents. While this might not seem significant to most people, It should and does to educators. Why are ING verbs so effective and why should their use be taught to students of all grade levels as a real life application to marketing? Simply because it's the perfect put-the-reader-in-the-picture verb. Reading an ING verb in a table of contents or chapter beginning drops you right into the how-to scenario. Consider the ubiquitous ING verb creating as in Creating a Diagram. The forceful nature of the suffix take you right into the process as if you were in the middle of it. Now this might sound trite, it isn't because ING words are worth billions, both in their effectiveness to sell just about anything to their marketing real-life applications that teachers should use a springboard for teaching them. Take a look at any for Dummies book's TOC (Table of Contents) and you can see the ING verbs in action, doing their marketing magic.